The University of Central Florida’s volunteer program, Knights Give Back, recently completed their Eighth Annual Day of Service! The program has grown extensively over the years, as more and more UCF students, alumni, teachers, and other volunteers have started lining up for their chance to give back. This year, thousands of volunteers working at more than 20 different volunteer sites across central Florida worked on a variety of projects helping the community and the environment. We at Pearls International are especially interested in this event because this year, one volunteer activity aims to help our favorite little ocean organisms – that’s right, oysters! 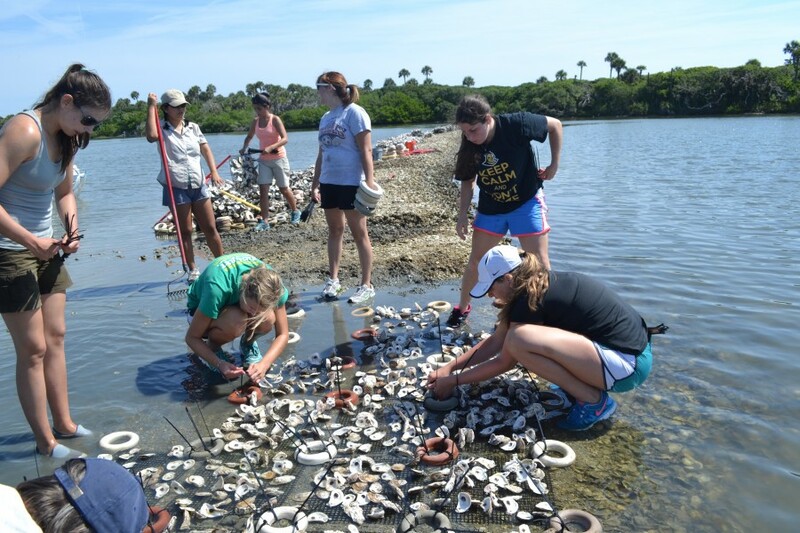 On October 11th, 2014, a multitude of students, teachers, and alumni, led by Dr. Linda Walters of the UCF biology department spent their day helping to restore degraded shorelines and oyster reefs in the Indian River Lagoon. Volunteers planted and transplanted mangroves and marsh grass, and created oyster restoration mats. These mats were placed in areas where oyster reefs used to exist, helping to restore the population. Oysters are a keystone, or essential, species and are filter-feeders, which means they actually clean the water as they eat, helping to create a healthy ecosystem in the lagoon. UCF Students creating oyster mats to help restore the oyster population.